We all know that Cannonball Adderley almost singlehandedly invented soul jazz. So you might expect this early LP of his to be a proto-funk classic, right? Wrong. It's actually a cool modal jazz LP very much in the style of Miles Davis' 'Kind Of Blue'. Which, of course, Cannonball played on. OK, now here's the controversial bit. It's better than Kind of Blue (at least to my ears - i've never been much of a fan of that LP - it suffers a bit from overexposure), and given that '...Blue' wasn't released until 1959, perhaps it also inspired it. Now, while I wait to be struck by lightning, let me tell you a bit more about this intriguing album. It does sound a bit like a mislabelled Miles Davis session to start with; his is the first horn you hear, and he certainly steals the show from Adderley on the opening 'Autumn Leaves', a lovely relaxed track with some pleasant soloing from all concerned. Miles is in a melodic mood here and returns again and again to the theme for inspiration, making this very easy on the ear. 'Love for Sale' kicks off in much the same vein, before taking a sharp stylistic turn at around 2:07, incorporating a latin influence before Adderley shows us what he's made of with an outstanding extended solo. He certainly shows Miles up - when he gets back on his horn, all he can do is return to the theme for a few bars before giving up. 'Somethin' Else' is just that. Again, Davis and Adderley are the main contenders with a fantastic bit of trading in the opening section. This time round Davis is in much stronger form and matches Adderley note for note. The other track worth mentioning here is the closing 'Alison's Uncle', an outtake from the original release which has been included on recent CD reissues, and is featured on my radio blog today. It's got the quickest tempo of any of the pieces here as well as featuring Blakey's best playing of the album, which can only be a good thing in my opinion. It is a bit more of a hard bop track than the rest of the album, perhaps why it was left off the original release. 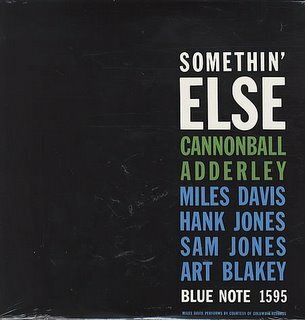 Adderley soon headed off to record for Riverside in more of a soul-jazz vein, but this record stands as firm evidence that he was also a talented modal and bop player.